LAS VEGAS - Motorola Mobility Inc. is rolling out to roll out a tablet computer that will run on Verizon Wireless' new next-generation wireless network and use an upcoming version of Google Inc.'s Android software designed for such devices. CEO Sanjay Jha showed off the Xoom along with several upcoming smart phones during a news conference Wednesday in advance of the International Consumer Electronics Show in Las Vegas. The tablet will come with a 10.1-inch high-definition screen, dual-core processor, front-facing camera for video chatting and a 5-megapixel camera that can take high-definition videos. It will support Flash video content - something Apple Inc.'s iPad does not do - and can work as a Wi-Fi hotspot to connect up to five more gadgets to the Internet. 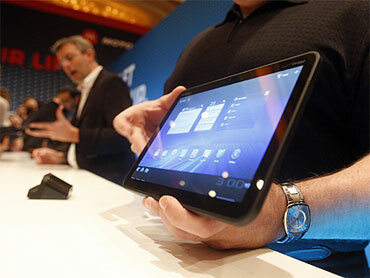 It will also have Honeycomb, a version of Android that has been designed for the larger touch screens on tablets. Current versions of Android are meant more for the smaller touch screens on smart phones. In a demo of the software, the Xoom's screen appeared to look more like a computer desktop than a smart phone screen, and Web surfing looked more as it does on a full-sized computer than on a mobile device. Jha said Honeycomb will include a redesigned version of YouTube and the ability to make video calls through Google Talk. "The user interface, the whole interactive model is designed for the tablet," he said. The Xoom will begin selling in the first quarter. Initially it will work with Verizon's 3G network and will be upgradeable so it can work on its new 4G network in the second quarter. Verizon began deploying its new network last year. It uses LTE, or Long-Term Evolution, technology, which is a standard technology behind the next-generation cellular networks, known as 4G. It is designed from the ground up to carry data. Network operators expect not just higher speeds but lower operational costs with LTE. Motorola Mobility, which is consumer-focused and split from the enterprise-focused portion of Motorola on Tuesday, was not the only company to trot out a Honeycomb tablet Wednesday: T-Mobile USA Inc. and LG Mobile Phones said T-Mobile will start selling the G-Slate in the coming months. The G-Slate will run on T-Mobile's HSPA+ network, which is an upgraded 3G network that the company refers to as a 4G network because it can achieve 4G speeds. After initially resisting, the International Telecommunications Union, a standards-setting body, has approved the practice of calling upgraded 3G networks "4G" - something that T-Mobile competitor AT&T Inc. also does.